Move over The Wolf of Wall Street. 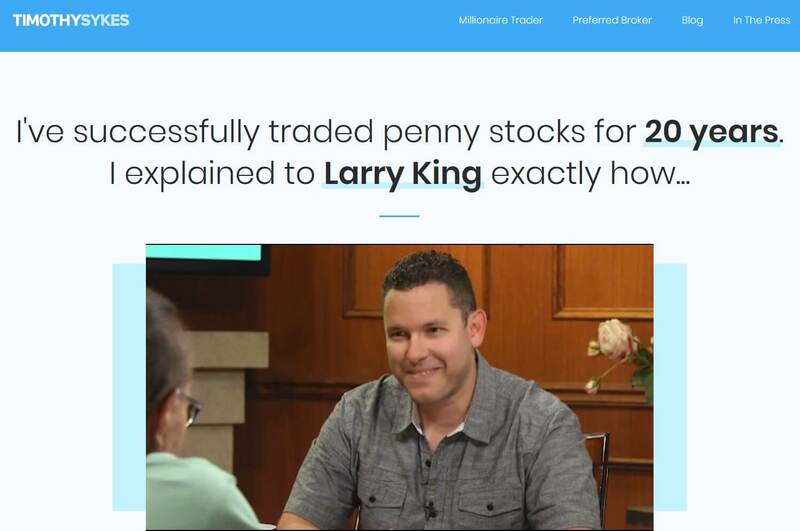 Timothy Sykes is taking legitimate penny stock trading to the mainstream. Earning his first million at age 22, Sykes rise to fame has made him one of the most recognized stock trading gurus out there. But with all of his accomplishments, there are still many naysayers that challenge his credibility. In this Timothy Sykes review, we’ll separate fact from fiction. We’ll let you know if this penny stock bad boy will make you millionaire or just leave you holding the bag. Who is Timothy Sykes Best For? 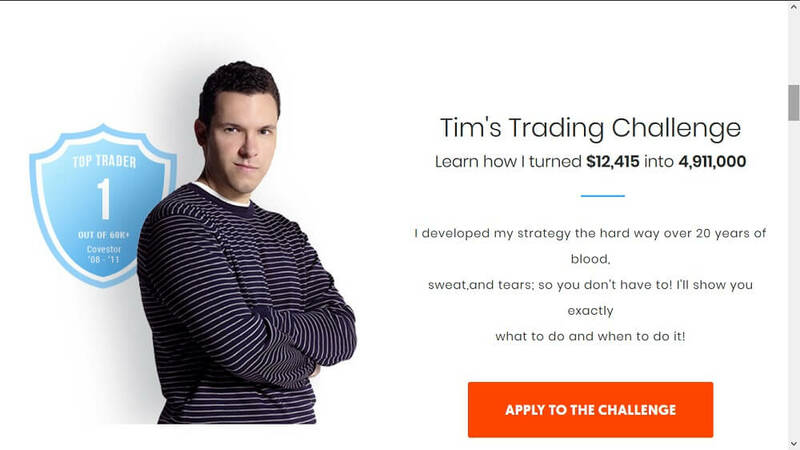 Timothy Sykes is a successful penny stock trader with over 20-years of financial market experience. Over that time, he has been featured in media outlets such as Larry King, The Steve Harvey Show, Fox News and The New York Times. Sporting a tremendous return record, Sykes went from making 57% in 2010 to a whopping 143% in 2017. To expand his reach, Sykes created his educational platform to teach other traders how to succeed in the market. And with over 3,000 students under his tutelage, Sykes’s strategies are adored by those looking for a competitive edge. Moreover, dozens of his students have went on to earn six figure trading profits per year using his strategy and he claims he’s helped several traders becomes millionaires as well. Timothy Sykes main service is his Millionaire Challenge. With exclusivity in mind, only dedicated applicants are accepted into the program. 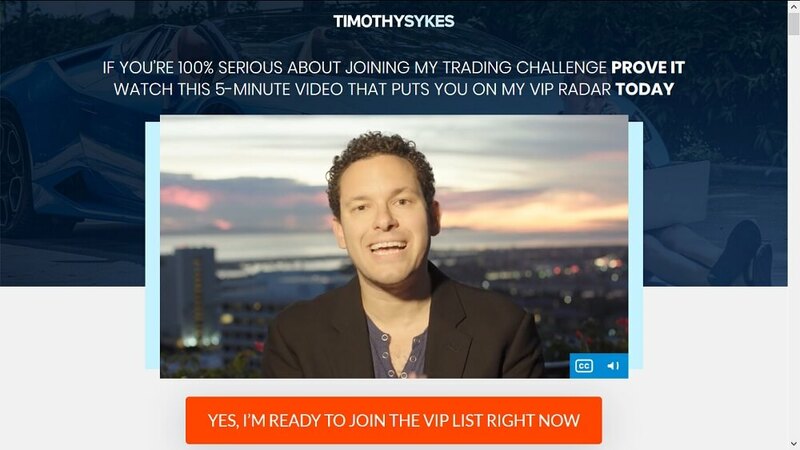 The Millionaire Challenge is Timothy Sykes VIP program, designed to teach the most advanced trading techniques he’s mastered over the years. A subscription comes in at $197 when you apply through email. Keep in mind though, the product is for highly motived traders. Before you become a member, Sykes and his team put you through ‘the interview:’ it’s an engaging one-on-one session designed to test your level of commitment. So what do you get if you make the cut? The educational content is jam-packed with a ton of valuable resources. According to Sykes – with the knowledge you obtain – you can place yourself in the top echelon of traders, even if you’re new to the game or never opened a brokerage account. What separates Sykes from other providers is his strategies focus on penny stocks. While other professional investors on Wall Street focus on large caps and well-known names, his training provides an advantage by focusing on stocks that others ignore. Investment banks and hedge funds have armies of analysts at their disposal. With that comes power, and more importantly, first access to insiders and material information to help them turn a profit. With penny stocks, they don’t have that advantage. Since issues are so small, large investment funds can’t exploit the market because there isn’t enough liquidity for them to trade. If a hedge fund tries to buy a penny stock, the price will rise rapidly because there aren’t enough sellers on the other side. Because of this, large fund managers avoid penny stocks and spend their time on equities with high volume. With the majority of professional investors ignoring penny stocks, you can use Timothy Sykes trading strategies to exploit inefficiencies and carve out a profit while no one is watching. What’s better, the content gets deeper the more you immerse yourself. You can also follow along in real-time as Sykes scours the market and puts his trading strategies to work. Watching him in action not only teaches you how to trade, but also helps you develop an intuition to know when the right time is to pull the trigger. Another benefit is software integration. As a well-respected developer, Sykes platform provides a bounty of market scanners and trading indicators to help you find attractive plays. And by using the software, you save hundreds of hours of research time each year. As well, he also provides tips on the best brokerage accounts to use to ensure you get the best price, fastest execution and most favorable trading terms. Risk management is also covered. Everyone knows how volatile penny stocks can be -- I mean, 30% to 40% swings aren’t uncommon when you trade in that arena. However, with his risk management strategies, you can follow his guidelines and help keep losses at a manageable level and avoid losing your shirt in the process. So what’s the deal with Tim Sykes? Whether it’s respected media outlets or his individual clients, many people have enjoyed their experience with Sykes. And while we’re skeptical that an average trader can earn the kind of profits his members boast about, it’s realistic to implement his strategies, earn a normalized return and grow your skills and confidence in the process. If you need a full service trading coach, give Tim Sykes a try. The sign up process is very detailed, so you’ll be briefed on everything you need to know regarding the course and his team will answer any questions you have. As well, $197 is a small outflow for the wealth of information you receive. You can try it out and see if it’s right for you. However, please be aware of the fact, that Timothy Sykes doesn't offer any free trial or money back guarantee. That leaves him behind the competition, and you should make sure to read the blog post “Best Trading Courses” before you go on. 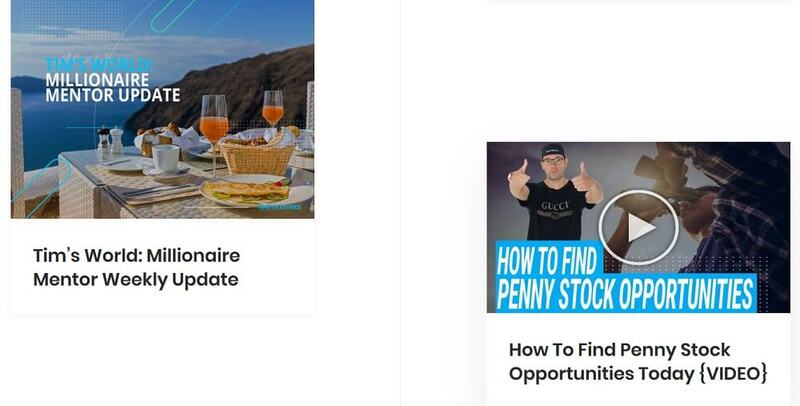 To get a glimpse of his strategies -- before taking the plunge into the Millionaire Program -- you can also sign up for Timothy Sykes Profit.ly Live Trading Alerts and Trading Videos. A Tim’s Alerts subscription comes in at $74.95 per month. Here, Sykes engages daily with subscribers through his chat room as well as updates you on his latest watchlists and the stocks he’s trading in the current session. A subscription comes in at $149.95 per month, but as with Tim’s alerts you can also receive a 28% discount by opting for an annual plan. We always recommend to stay away from annual plans! While the alerts are tailored to those that want to follow Sykes strategies, Pennystocking Silver adds to the service by combining his daily plays with theory and education. The idea is to following his picks, then learn to spot the plays on your own. While the Millionaire Challenge starts at $197, a full membership is estimated in the $3,000 range. However, by subscribing to Tim’s Alerts or Pennystocking Silver you have a more cost-effective way to assess how efficient Sykes strategies are and whether the service is right for you. However, as I lined out in my Profit ly review, I am of the opinion that profit.ly is not worth trying it. Check out the profit ly review to learn why. Unfortunately, Sykes does not offer a free trial for his Millionaire Challenge, Tim’s Alerts or his Pennystocking Silver service. However, Tim Sykes Blog offers a wealth of information on subjects like: how to trade candlestick patterns, how to spot the best penny stock opportunities and how to read and calculate implied volatility. Upon signing up for the Millionaire Challenge, you also receive free access to Timothy Sykes book: Trading Foundations. The book includes a lot of useful information on day trading psychology and also includes case studies that help with real-life application. Unlike other trading providers Tim Sykes has specialized programs for specialized clients. He looks for students that are extremely dedicated and have both the time and energy to learn. More importantly, his tutelage is not a quick fix. To perfect a winning trading strategy you need to absorb his training and continuously work to increase your skill set. That’s the reason why Sykes is so selective with his enrollment. However, if you take trading seriously and want to be one of the best, Tim Sykes can help take you there. 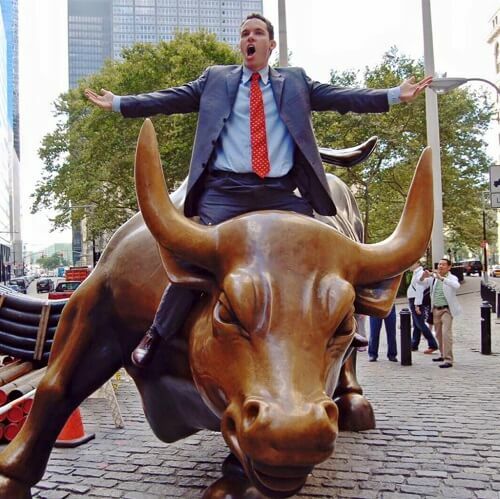 Make sure to understand that Timothy Sykes is trading penny stocks. Due to the lack of volume most penny stocks have, prices can fluctuate within seconds by 100% and more. While it is nearly always possible to open a position, many times it is not possible to close the position at the price you may want. Please understand, that the risk involved is extremely high. While we’re confident in Timothy Sykes training, make sure know what you’re getting into before you sign up. Success isn’t built overnight so to get your money’s worth with Sykes, you need to dedicate yourself and put in the work. As an all-encompassing program, the Millionaire Challenge is advanced and only open to those who qualify. You need to go through an interview process that ensures you’re right for the program. With an initial sign up cost of $197, a full subscription is estimated in the $3,000 range. 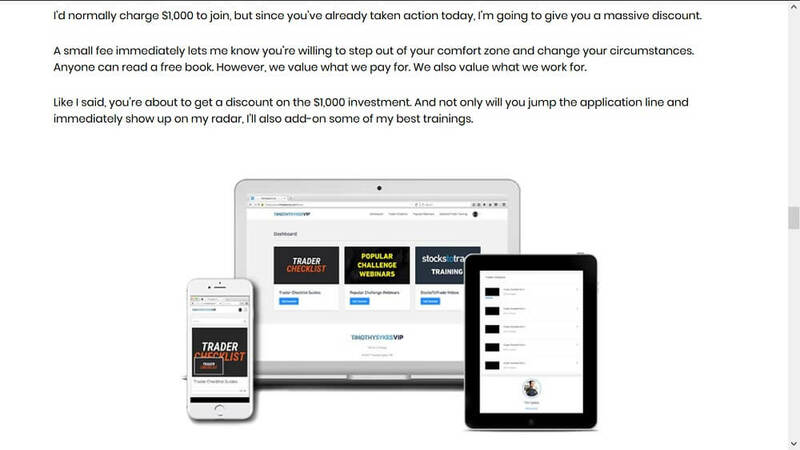 Alternatively, you should consider following the leader in online trading education Ross Cameron at Warrior Trading. As I line out in my Warrior Trading Review, he is the only trading educator I know, who publishes the bank account statements on the website. Furthermore, if you are looking for automated trading far away from trading educators, then you should take a closer look at Trade Ideas. They provide hundreds of trading strategies as well as automated (full and semi) trading, charting, strategy development, backtesting and also some free services.